A combination of R&D and feedback from military and professional end users is credited with influencing the development of Norsafe’s new Munin S1200 Open model – which, as its name suggests, offers an open-deck variant on the company’s existing Munin S1200 closed cockpit design. As with past Norsafe Munin models, the new boat is designed for optimal manoeuvrability and with low freeboards, to assist with search and rescue (SAR) missions such as recovering casualties from the water. An additional influence on design has been the open RIB-D / RHIB-D concept, with its stepped, balanced hull, which was most recently incorporated into Norsafe’s Marathon 900 RHIB-D class (see Ship & Boat International January/February 2018, page 8). The symmetrical nature of the Munin S1200 Open’s cockpit layout for three crew members, meanwhile, has been influenced by the arrangement aboard Norsafe’s Magnum 850 class. The ergonomically designed helm and seats are intended to offer maximum comfort to the crew, while the boat’s rigid construction was formulated to significantly curb excessive noise and slamming. The one-level deck is step-free, to lower the likelihood of trips and falls, and anti-skid surfaces have been added to all walking areas for crew and personnel safety. As well as SAR service providers, Norsafe describes the typical Munin S1200 operator as being employed in the “special forces, coast guard, law enforcement, aqua-farming and/or offshore” sectors. The vessel features a 24degs transom double stepped hull, for optimal manoeuvrability at high speed. The prototype version of the Munin S1200 Open is powered by three 298kW Mercury Verado outboards. Norsafe claims that it chose these engine types “based on market demand and internal feedback”, though customers will be able to order versions of this class with twin waterjets, twin stern drives and twin surface drives, if they wish. 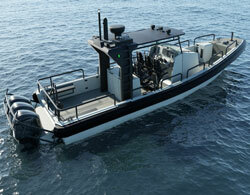 The triple-Mercury Verado arrangement is sufficient to help the boat to achieve a top speed of 65knots. In order to further assist the Munin S1200 Open’s capability for fast navigation, the boat type has been constructed from composites. Norsafe explains: “The high speed of the vessel is achieved by using light materials like advanced laminates: multiaxial glass fibre mats, sandwich foam construction, vinylester and the use of vacuum infusion as a method of composites production.” A foam stiffener system infused in the hull lamination together with the liner makes up the boat’s hull structure. “High-performance glue has been used to adhere the liner to the hull, with no wood being used in the construction,” Norsafe adds. The top part of the boat’s bimini has been constructed in fibre and vinylester, using vacuum infusion, while the sunroof structure has been fashioned from marine grade aluminium, with an optional GRP hard-top roof. Other onboard features include: eight stainless steel mooring cleats; a locker for chains and ropes; water gussets, situated on both sides of the aft end of the cockpit; cargo rails, enabling crew to fix seats, storage boxes and other items of cargo or equipment on the deck; and VHF, loudhailer and intercom capabilities.